Last meeting: SM East won 23-22 in week five. I'll start with defense for Olathe North because that's where they've been making a living the past several weeks -- most notably, the number 31. That's the astounding number of turnovers their defense has forced through 11 games. By comparison, last year in Sub-State SM West had forced 21 turnovers, and Free State had forced 22. Olathe North's defensive advantages stem from their tremendous athletic ability, and unique 3-4-4 scheme. Their primary secondary quad of Jamil Brown (four interceptions), Chaz Burgess (five interceptions), Vinnie Shabbaz (two interceptions) and Isaiah Simmons (five interceptions) is about as good of a secondary as you'll find anywhere in the state of Kansas. Meanwhile, linebackers Jadon McGaha, Jesse Kendricks, Jimmie Swain and Marcel Spears have combined for 432 tackles, and six takeaways. Offensively is where the Eagles will need more production, however. Quarterback Cole Murphy and running back Venus Triplett combined for just 62 yards rushing against Free State, and that number will need to be much higher if they want to come away successful this round. Olathe North will also need a better effort from their receivers. Tight end Josh Moore, who has the talent and ability to win any one-on-one battle, had a case of the drops last week, which didn't help things. We'll see if he and receiver Mauricio Chio can help diversify the offense against SM East. The Lancers are a victory away from advancing to the state title game for the first time in school history. Twelve weeks ago you would have been hard-pressed to find anyone outside of the SM East program who saw the Lancers making it to Sub-State, let alone toting a 10-1 record. The seamless transition from Chip Sherman to Dustin Delaney -- including the many fourth quarter victories they've managed -- has made a for a story book season around Prairie Village. "Lancer Magic," as it's come to be know, has made for one of the most compelling Sub-State story lines we've had in years. SM East is difficult to prepare for because they come at you from so many different angles. If you work to slow player A, player B comes out of nowhere and has a big game. We've seen rotating star players for the Lancers throughout the year and don't be shocked if someone comes out of the woodwork to lead the team Friday. The past two weeks we've seen junior quarterback Gunnar Englund play in place of injured starter Christian Blessen. There's no status on Blessen's return, but Englund has played exceptionally well, so it shouldn't make much of a difference who starts. Fullbacks Luke Taylor (11 touchdowns) and Ryan Carter (three touchdowns) give the Lancers an exceptional punch up the middle, especially in goal-line situations. Wing backs Mitchell Tyler, Sam Huffman and Micah Dodson are all major threats to score any time they touch the ball, via run or pass. 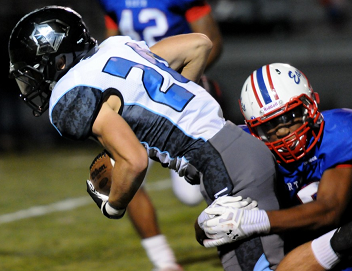 Defensively, the Lancers spread their contributions almost as equally as they do on offense. Kyle Ball leads the team in tackles with 95, including 27 for loss. Rider Terry and Carter have 75 tackles apiece. Anchoring the center of the defensive line is Dominique Atkinson (66 tackles, 20 for loss), but you can't look past the SM East secondary. Charley White, David Spivak and Will Oakley have developed into one of the league's premier defensive backfields through the season, combining for seven interceptions and three forced fumbles. Would it really surprise us if SM East won? Would it really surprise us if Olathe North won? We've seen some fluke Sub-State appearances through the years, but this is not one of those situations. Both teams are loaded, and I could easily see either taking a state title in two weeks. If I had to narrow this game down to a couple facets, I would say keep an eye on the turnovers, as well as the penalties and field position battles. Basically, the little things that win games. I don't expect either team to come out and blow the other out of the water, although it's certainly possible it could happen. Olathe North showed me last week they only needed about a C+ effort to take down Free State. Imagine an A effort. SM East has basically illustrated to the league that they're a machine, week in and week out, winning games and taking names. They've had some close calls, but with one exception they tend to end up on the winning side of the ledger, somehow, some way. The entire 2013 Sunflower League season, dating back to the start of two-a-days in August, and weights and conditioning last November, has boiled down to this one final game between the Lancers and the Eagles. And that's just how things go in the Sunflower League.